I am not sure when this was written but the content makes it fairly recent. This is an excellent article that lists the reasons for the weakness of the pro warming argument. There is little that can be added except to suggest that one takes the time to read through it and enjoy. It is well written. It is remarked that scientists have been far too quick to accept work in other fields quite blindly without effectively doing their own homework. The problem has been their willingness to second such work. So science becomes public relations. This is a good antidote. Our climate is changing, just as it has always done, and always will. In fact, the only constant about our climate is that it changes, which makes you realize the term "climate change" is at best meaningless, and at worst intentionally ambiguous. It feels silly that I need to say this, but clearly it has to be done. The main determinant of our climate is not some gas, which comprises 0.038% of the atmosphere, but the Sun, the planet's orbital eccentricities and axial wobble, cosmic ray flux, and other celestial factors. Greenhouse gases play an important role, but a passive one. It should not come as a surprise that our entire solar system has been warming for the last quarter century, or that the most accurate weather forecasts come from algorithms that concentrate on solar fluctuations and cosmic rays. Although Mann et al compiled it in 1998, it was not until 2003 that the first independent person was able to look at the algorithms used in the graph, because they refused to release it. It turned out that, even using completely randomized data, one could create a graph that looked exactly the same because the algorithms had a bias to exaggerate the last century! Not only that, but it should be obvious from the fact that the Vikings were settling and farming Greenland from the 9th to the 13th century, in places now covered with permafrost and ice, that this graph is just total nonsense! Of course, this was not before the graph had been used as the backdrop for the 2001 UN Intergovernmental Panel on Climate Change. You would have thought that was a pretty good indication of their scientific integrity, but I promise you it gets much, much worse. Perhaps even more interesting than the inability of the IPCC to verify its data before using it at all, let alone as a centerpiece, or subsequently apologizing after it became public how fraudulent the graph was, is the fact that environmentalists to this day still use this graph to illustrate their points. Al Gore's entire sensationalist "documentary" (boy is that charitable) revolves around this widely discredited graph and others like it. It should honestly occur to us that anyone who continues to use this graph to support their arguments has little interest in actually presenting reality. The IPCC used to publish the real temperature data on the past millennium in its earlier reports, but not anymore because it’s an inconvenient truth to their agenda. Thanks for that observation. I am not so sure that the linkage is quite that precise and nice, but it certainly reminds us that the opposite might also be considered. That the little ice age may also have reduced the CO2 content which is been released as it now warms. And of course, no one has a mechanism for all this as yet although the first place I would look is at the permafrost since it is capable of alteration in the time frames discussed. Yet no mechanism suggests itself there, so we must wait for the science. 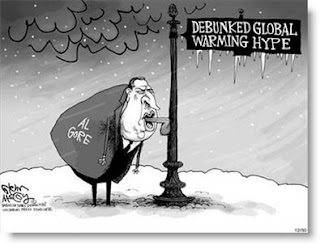 How convenient that Howard and Bush and all the nasty polluting companies proclaimed themselves GW sceptics, so that we'd all associate GW scepticism with idiocy and apathy.